I finally finished the armoire! I purchased it almost 2 and half years ago from an estate sale for $50. It was the first project that Chris and I worked on together and it's turned out sooo lovely. When I bought it, I had ideas of just sanding it down and throwing some paint on it. 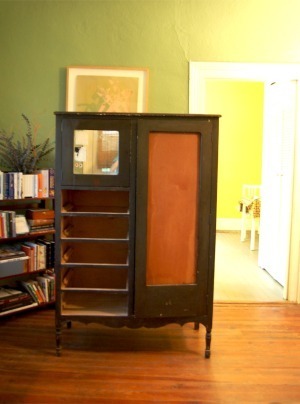 I learned quickly that Chris likes to really do things right, and this armoire was going to be one of them. We did paint-stripping and used an electric sander to get all previous coats of varnish and paint off it. Then he let me use a white stain on it... he probably wouldn't okay that decision today because he's not a fan of anything that looks remotely "shabby chic." But we had only recently started dating and I think he was just being nice. So we stained it white and called it a day. I had always wanted to redo the front door with fabric, but could never find the time. A few weeks ago I realized that I'd never find the time unless I made the time. So I measured the opening (measure twice, cut once) and the little one and I went to the big box store and got a piece of really cheap wood. They cut it to size and we were on our way. I had a piece of fabric from Ikea that I decided would look nice. That weekend, I adhered the fabric to the wood with Yes Paste (too lazy to get something proper, but the Paste worked well!!) and tacked it up on the door! We use the drawers for the baby's clothes and wanted to use the closet side for additional baby stuff. I had a few extra bins from Ikea and used those for shelves. Yay!! I'm so glad this project is done and I'm really happy that Chris and I did it right!